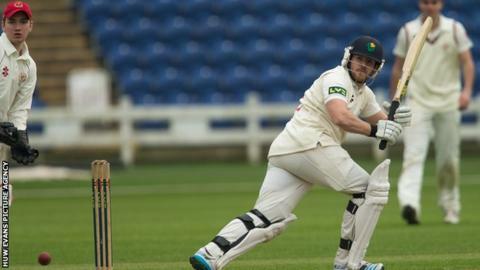 Glamorgan batsman Will Bragg says the county must build on their unbeaten start to their County Championship campaign. Bragg hit an unbeaten 91 as the Welsh county fought back to draw against Division Two leaders Worcestershire in Cardiff on Wednesday. Glamorgan, who are fourth, face second-placed Hampshire on 11 May and Bragg hopes they can continue their run. "Hopefully we can kick on from here," he said. "It's crucial the first session of the first day. "We've really had to play catch up in most games so far. "But we haven't lost yet and we've got a bit of momentum." Meanwhile, Glamorgan batsman Murray Goodwin has been reprimanded for dissent by the ECB following the Worcestershire match. Goodwin was reported by umpires Michael Gough and Russell Evans for a level One breach of the code, showing dissent at an umpire's decision. Glamorgan all-rounder Graham Wagg is now top of the county championship's most valuable player rankings. He took another five wickets against Worcestershire.